Well, the controversial Pink Mercy Skin pricing aside, Blizzard raised close to $10 million in sales of the skin across all three platforms. All proceeds are going directly to the Breast Cancer Research Foundation. 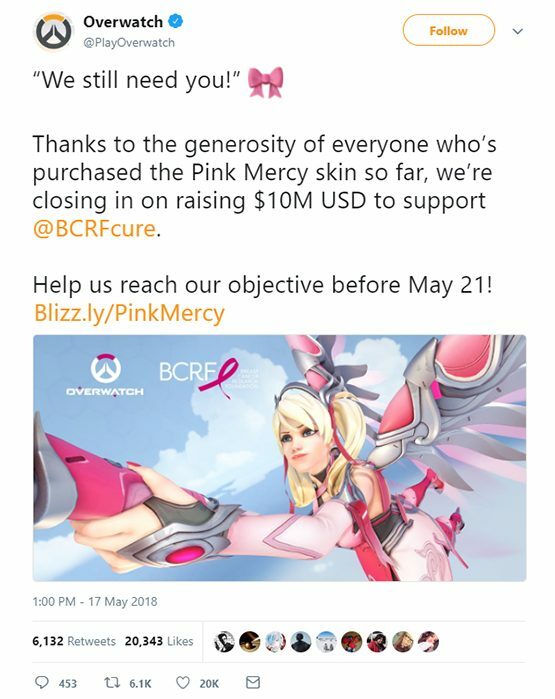 Blizzard has been actively promoting both this charity fundraiser and overall awareness of the fight against breast cancer. One of their methods has been to host various Overwatch streamers, which has highlighted numerous strong girl streamers in the Overwatch community. You can check out their full schedule of the streams on the Pink Mercy website. You’ll also find on the website that Blizzard is selling a Pink Mercy shirt as well. The fundraising has not ended, however. Blizzard will continue to sell the skin through March 21st. Nothing else has come from the aforementioned controversy other than Sony denying the claims that they are taking a portion of the proceeds from the skins. Perhaps it was just poorly worded compared to the Xbox and PC marketplaces. Did you pick up a Pink Mercy skin?